Chinese New Year (Chinese: 春節, 春节, Chūnjíe; 農曆新年, 农历新年, Nónglì Xīnnián; or 過年, 过年, Guònián), also known as the Lunar New Year or the Spring Festival is the most important of the traditional Chinese holidays. It consists of a period of celebrations, starting on New Year's Day, celebrated on the first day of the first month of the Chinese calendar, i.e. the day of the second new moon after the day on which the winter solstice occurs, unless there is an intercalary eleventh or twelfth month in the lead-up to the New Year—in such a case, the New Year falls on the day of the third new moon after the solstice. (The next time this occurs is in 2033.) The Chinese New Year period ends with the Lantern Festival, the fifteenth day of the month. Some Chinese believe that Nian ("Nyehn") was a reptilian predator that could infiltrate houses silently like the infamous man-eating leopards of India. The Chinese soon learned that Nian was sensitive to loud noises, and they scared it away with explosions and fireworks. The origin of the Lunar New Year Festival can be traced back thousands of years, involving a series of colorful legends and traditions. One of the most famous legends is Nian, an extremely cruel and ferocious beast that the ancients believed would devour people on New Year's Eve. To keep Nian away, red-paper couplets are pasted on doors, torches are lit, and firecrackers are set off throughout the night, because Nian is said to fear the color red, the light of fire, and loud noises. Early the next morning, as feelings of triumph and renewal fill the air at successfully keeping Nian away for another year, the most popular greeting heard is "gong xi fa cai", or "congratulations." To ensure good luck in the coming year, the Taiwanese always give every dish a special name. This dish is called the "Five Blessings for the New Year" and represents longevity, wealth, peace, wisdom, and righteousness. (Photo by Su-ching Chang) Even though Lunar New Year celebrations generally last for only several days, starting on New Year's Eve, the festival itself is actually about three weeks long. It begins on the twenty-fourth day of the twelfth lunar month, the day, it is believed, when various gods ascend to heaven to pay their respects and report on household affairs to the Jade Emperor, the supreme Taoist deity. According to tradition, households busily honor these gods by burning ritualistic paper money to provide for their traveling expenses. Another ritual is to smear malt sugar on the lips of the Kitchen God, one of the traveling deities, to ensure that he either submits a favorable report to the Jade Emperor or keeps silent. The Chinese New Year starts with the New Moon on the first day of the new year and ends on the full moon 15 days later. The 15th day of the new year is called the Lantern Festival, which is celebrated at night with lantern displays and children carrying lanterns in a parade. Preparations for the Chinese New Year in old China started well in advance of the New Year's Day. The 20th of the Twelfth Moon was set aside for the annual housecleaning, or the "sweeping of the grounds". Every corner of the house must be swept and cleaned in preparation for the new year. SpringCouplets, written in black ink on large vertical scrolls of red paper, were put on the walls or on the sides of the gate-ways. These couplets, short poems written in Classical Chinese, were expressions of good wishes for the family in the coming year. In addition, symbolic flowers and fruits were used to decorate the house, and colorful new year pictures (NIAN HUA) were placed on the walls (for more descriptions of the symbolism of the flowers and fruits. New Year Paintings - During the Spring Festival (Chinese New Year), it is traditional to decorate the homes with new year paintings. The most popular paintings are Door Gods pasted on the front doors to keep ghosts and monsters away. Spring Couplets - Spring couplets are traditionally written with black ink on red paper. They are hung in storefronts in the month before the New Year’s Day, and often stay up for two months. They express best wishes and fortune for the coming year. There is a great variety in the writing of these poetic couplets to fit the situation. A store would generally use couplets hat make references to their line of trade. Couplets that say "Happy New Year" and " Continuing Advancement in Education" are apprpriate for a school. A reunion dinner is held on New Year's Eve where members of the family, near and far, get together for celebration. The New Year's Eve dinner is very large and traditionally includes chicken. Fish is included, but not eaten up completely (and the remaining stored overnight), as the Chinese phrase "nian nian you yu", or "every year there is fish/leftover", is a homophone for phrases which could mean "be blessed every year" or "have profit every year", since "yu" is also the pronunciation for "profit". The New Year's Eve celebration was traditionally highlighted with a religious ceremony given in honor of Heaven and Earth, the gods of the household and the family ancestors. New Year's day is also celebrated within the family. Usually family members gather on the morning of New Year's Day. It is at this gathering that red packets are given to unmarried members of the family. The age of the recipient is not material to receiving the packets. Married couples usually give out two red packets on the first new year after being married. This is because the wife presents one and the husband presents one. In subsequent years they may give one as a couple. Red packets traditionally consisted of amounts which were considered multiples. Amounts like $2 (two piece of $1), or $20 were acceptable. Similarly "multiples" such as $1.10 and $2.20 were also acceptable. However, this is not strictly adhered to. The gift was originally a token amount but these days it is not uncommon to receive large sums in affluent families. In some families this tradition has evolved into the practice to substituting money-like instruments (stocks, bonds, unit trust) in place of large sums of cash. Red packets are also given to unmarried visitors but the sums are often smaller than the packets given to family members or close friends. The second day of the new year is usually for visiting the family of the wife if a couple is married. A large feast is also typically held on the second day of the new year. The seventh day traditionally is known as the common man's birthday, the day when everyone grows one year older. It is also the day when tossed fish salad, yusheng, is eaten. People get together to toss the colourful salad and make wishes for continued wealth and prosperity. This is only celebrated amongst the Chinese in Southeast Asia, such as Malaysia and Singapore. Niangao (粘糕) The Chinese word 粘, meaning "sticky", is identical in sound to 年, meaning "year", and the word 糕, meaning "cake" is identical in sound to 高, meaning "high". 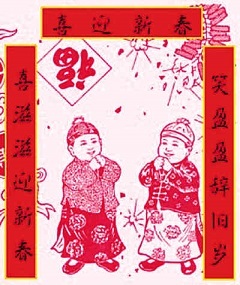 As such, eating niangao has the symbolism of raising oneself higher in each coming year (年年高升 niánnián gāoshēng). 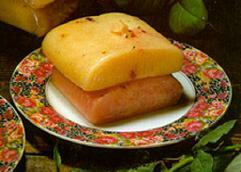 Chinese families who practice Chinese traditional religion also offer niangao to the kitchen god, Zao Jun. It is believed that all the household gods go off to heaven to report on a family during the new year. Serving niangao to the kitchen god is believed to help him provide a sweet report on the family because he will be satisfied and not inclined to deliver criticism — or that his lips are so sticky from the cakes that he is unable to make too much of a report. Fagao Literally translated as "Prosperity Cake", fagao is made with wheat flour, water, sugar and leavened with either yeast or baking powder. Fagao batter is steamed until it rises and splits open at the top. The sound "fa" means either "to raise/generate" or "be prosperous", hence its well intending secondary meaning. Jiaozi Dumplings, are small or large mounds of dough that are usually dropped into a liquid mixture (such as soup or stew) and cooked until done, some are stuffed with meat and/or vegetables. Yusheng, a salad of raw fish and shredded crunchy vegetables (such as carrots, jicama, pickled ginger and pomelo) in a plum sauce dressing. Although commonly served in China throughout the year, it was popularised as a Chinese New Year dish in Singapore and Malaysia, a practise which has since spread to other Chinese communities. Originally served only on the seventh day of the new year, it is now eaten on any day, sometimes as early as two weeks prior to the commencement of the new year. Mandarin oranges (a symbol of wealth and good fortune). The Cantonese word for these oranges is a homonym for gold. Whole steamed fish (a symbol of long life and good fortune). This can be seen in wall decorations of fish themes. The word 魚 (yú), meaning "fish", shares the same pronunciation with the word 餘, meaning "surplus" (e.g. having money left over from covering expenses). The common greeting for the new year "niannian you yu" can mean to enjoy a surplus, i.e. financial security, year after year.